Unwanted hair can be uncomfortable and aesthetically displeasing, but waxing, shaving, and plucking are inconvenient and time-consuming. At Skin Deep Laser MD, Dr. Riehm offers laser hair removal using the Vectus® laser for more permanent results. Men and women in Fort Worth, Texas, who are tired of managing unwanted hair can call the office or book an appointment online to learn about the long-term benefits of laser hair removal. A commonly performed procedure in the United States, laser hair removal involves sending highly concentrated light energy into hair follicles in target areas. The pigments in these follicles absorb the light, effectively destroying the follicle. What are the benefits of hair removal with the Vectus laser? The Vectus laser offers the fastest hair removal available. The technology is effective and safe on all skin types and works at a high volume. The laser has the largest spot size available today, so it can treat even expansive areas, such as your back, in less than ten minutes. Multiple follicles are treated with each pulse. The Vectus laser leaves surrounding skin unaffected while effectively targeting your hairs. The Vectus laser effectively treats small areas, like just above the lip, as it does large areas, such as your chest. The Vectus laser is much more comfortable than older hair removal lasers for several reasons. The laser is a purpose-built laser, meaning it was built specifically for the purpose of laser hair removal and nothing else. Because it only removes hair, it is much more efficient than devices that do multiple different things, and, because it is more efficient, it is able to remove hair with fewer treatments and at a lower energy setting than older devices. The lower energy setting makes it much safer and much more comfortable than other technology. In addition, it is equipped with a sapphire cooling tip for additional comfort. You may feel some discomfort during treatment, but it should noot be painful. The process is quick and most patients tolerate it well. You may have some redness of your treated skin for a few days, but this is temporary. You can go right back to your daily activities following laser hair removal. We recommend that you avoid a workout and increasing your body temperature or sweating for the rest of the day. You’ll want to make sure you apply sunscreen if the treated areas will be in the sun, as your skin is temporarily more sensitive to ultraviolet light. This sensitivity lasts about six weeks after a session. How many treatments will I need for effective hair removal? Most people reach their desired results after six sessions of laser hair removal. Exactly how many sessions you’ll need depends on the density and thickness of your hair, as well as the color. Thick, dark hair may require more sessions. 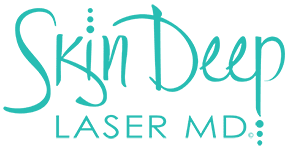 To learn more about how laser hair removal can give you the smooth skin you desire, call Skin Deep Laser MD or book an appointment online.